In December 1950 the San Diego Blood Bank was established through the support of the San Diego County Medical Society. The foresight and dedication of founding fathers Dr. Thomas O'Connell and Dr. Frederick G. Hollander, led us to the San Diego Blood Bank of today, an organization known for excellence in its service to our community. Prominent San Diegans have taken pride in the San Diego Blood Bank from its earliest beginnings, Jonas Salk, Allan Klauber, Neil Morgan, John Quimby, William Stephens, Sr., Legler Benbough, Dr. J.B. Askew, Mayor Harley Knox and Councilman Charles C. Dail are among those who supported it during its first two decades. From 1950 to 1953, annual donations averaged 27,000 pints in San Diego County. 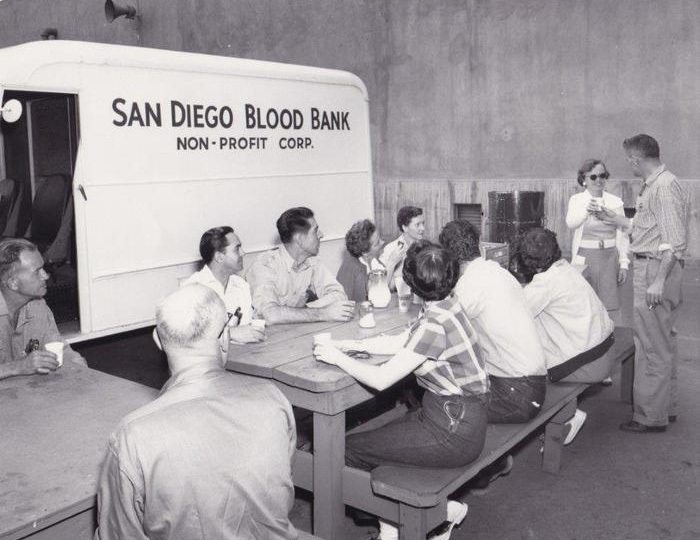 In the 1960's San Diego Blood Bank's growth continued and so did donations, nearly 40,000 pints were given annually by 1969. The 1970's ushered in an era of tremendous development. Our landmark Hillcrest headquarters opened in 1972 and our first satellite location, the North County Donor Center, opened in Escondido in 1978. By 1986, donations reached 86,000 pints annually and have exceeded 100,000 for many years now. Today, we operate six full-service regional centers and 12 fully equipped mobile units available for on-site blood drives. San Diego Blood Bank fixed centers are located in El Cajon, Escondido, Sabre Springs, San Diego, Vista and Carmel Valley. Our bloodmobiles travel throughout the Southern California region from San Diego’s most southern cities to the Imperial Valley in the east and as far north as Orange County. Dramatic events and exciting medical advances have accelerated our development. The progress of open-heart surgery and its concurrent blood requirements in the mid-1960s propelled the San Diego Blood Bank into an even more vital role in our community. In the late 1960s, we were also in the forefront of medical technology when we were one of the first blood banks in California to institute hepatitis screening on all donated blood. The San Diego Blood Bank has also helped to develop and institute stringent blood screening tests as soon as they were approved by state and federal licensure. In addition, in 1981 we were among the first blood banks in the nation to formalize a designated donor program, which allows patients to select their own donors. Our autologous donor program also was put into place more than 30 years ago for patients who wish to pre-deposit their own blood for planned surgery. One thing that has not changed since the very beginning is the remarkable commitment and selfless spirit of our most vital resource-blood donors. Our entire donor population is solely volunteer and has been since 1974. Some of today’s donors are as young as 17 and nearly half are women. Their generosity is as keen as ever. In fact, a few of our regular donors have been with us almost as long as we’ve been in existence! The San Diego Blood Bank is licensed by the State of California Department of Health Services and by the Federal Food and Drug Administration. It is a fully accredited member of the American Association of Blood Banks (AABB) and a member of the California Blood Bank Society (CBBS), America’s Blood Centers (ABC), Blood Centers of America (BCA), the Blood Centers of California (BCC) and is the local Cord Blood Registry for the National Marrow Donor Program (NMDP). It is also the California Emergency Medical Services Authority (EMSA) designated Southern California Regional Operations Center for the distribution of blood to Southern California in the event of a major disaster or act of terrorism in the State of California.